UPDATED: Tue., June 27, 2017, 12:05 p.m.
WASHINGTON – The Trump administration’s top environmental official met privately with the chief executive of Dow Chemical shortly before reversing his agency’s push to ban a widely used pesticide after health studies showed it can harm children’s brains, according to records obtained by The Associated Press. Environmental Protection Agency Administrator Scott Pruitt’s schedule shows he met with Dow CEO Andrew Liveris for about a half hour on March 9 during a conference held at a Houston hotel. Twenty days later Pruitt announced his decision to deny a petition to ban Dow’s chlorpyrifos pesticide from being sprayed on food, despite a review by his agency’s scientists that concluded ingesting even minuscule amounts of the chemical can interfere with the brain development of fetuses and infants. EPA released a copy of Pruitt’s March meeting schedule earlier this month following several Freedom of Information Act requests. EPA did not respond this week to questions about what Pruitt and Liveris did discuss during their March 9 meeting, or whether the two had also met on other occasions. Liveris has close ties to the Trump administration. He heads a White House manufacturing working group, and Dow wrote a $1 million check to help underwrite the president’s inaugural festivities. The American Academy of Pediatrics has urged Pruitt to take chlorpyrifos off the market. 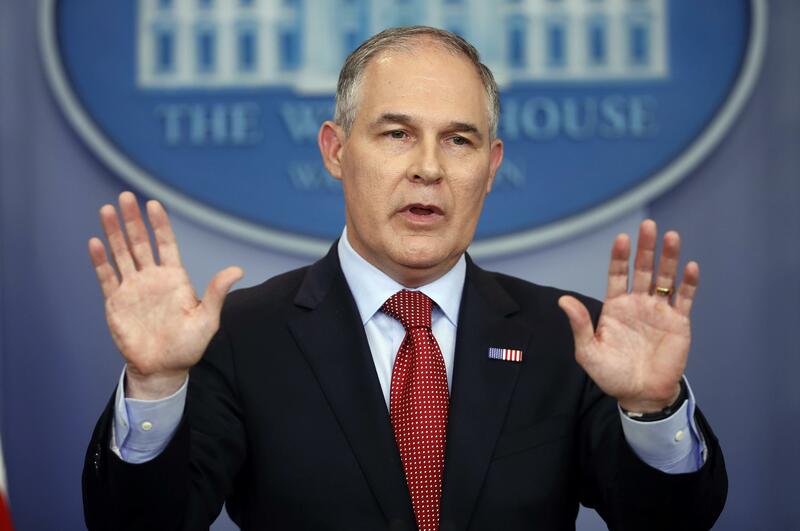 The group representing more than 66,000 pediatricians and pediatric surgeons said Tuesday it is “deeply alarmed” by Pruitt’s decision to allow the pesticide’s continued use. The AP reported in April that Dow is lobbying the Trump administration to “set aside” the findings of federal scientists that organophosphate pesticides, including chlorpyrifos, are also harmful to about 1,800 critically threatened or endangered species. First developed as a chemical weapon prior to World War II, Dow has been selling chlorpyrifos as a pesticide since the mid-1960s. It has been blamed for sickening dozens of farmworkers in recent years. Traces have been found in waterways, threatening fish, and experts say overuse could make targeted insects immune to the pesticide. Published: June 27, 2017, 11:36 a.m. Updated: June 27, 2017, 12:05 p.m.